The Iowa Senate has voted to ban traffic enforcement cameras in Iowa. In addition, the bill would deny Iowa vehicle information to other states with automated ticketing systems, so Iowans wouldn’t have to pay any ticket anywhere for speeding or running a red light that’s generated by a traffic camera. Republican Senator Jake Chapman of Adel said traffic cameras are used “to generate revenue” for cities. Senator Brad Zaun, a Republican from Urbandale, has been trying for nearly a decade to get rid of traffic cameras in the state. Claire Celsi, a Democrat from Des Moines, voted against the traffic cam ban after revealing she got a ticket in the mail yesterday because she was caught speeding by a camera on the Des Moines freeway. 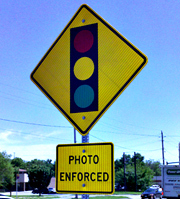 Senator Bill Dotzler, a Democrat from Waterloo, said people in his city are “fed up” with vehicles running red lights at a high rate of speed and red light cameras have recently been installed at some Waterloo intersections. “I know that this is an ongoing discussion in my community and I have seen a shift in people’s concerns about the traffic cameras,” said Dotzler, who has voted before to ban the cameras, but voted against the ban today. A bill eligible for debate in the Iowa House takes the regulatory approach. It would require proof cameras are placed in areas to improve public safety. The bill also would take 60 percent of the fines away from the cities and instead use that money to finance Iowa Department of Public Safety operations.